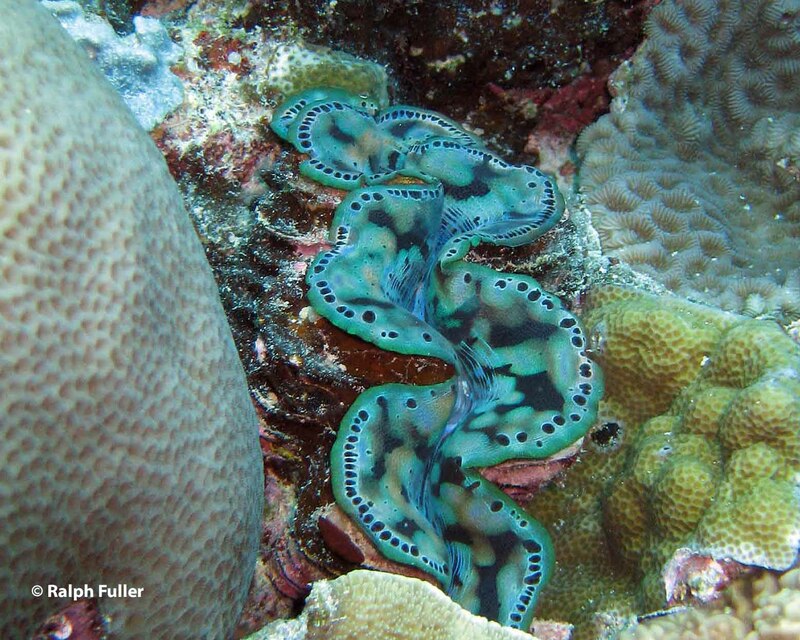 Until they went extinct in Atlantic waters, the forerunners of animals like blue corals and this giant clam, today found only in the Indo-Pacific, also lived in what are now European and American waters. CONSIDER THE TRIANGLE OF DIVERSITY. It wasn’t that long ago (in geohistory terms) that tropical marine life was distributed much more uniformly worldwide than is the case today. The Earth’s landmasses were configured differently and a strong current circled the planet along the Equator, widely dispersing tropical life. So why, today, do many of us have to travel to the other side of the world to see extra-exotic species like the ornate ghost pipefishes, false clown anemonefishes and the aforementioned giant clams, all found in the Pacific and not the Caribbean? Two important reasons are continental drift and the cycle of past ice ages. In the Earth of some 150 million years ago, the continents had begun to separate from Pangaea, enabling development of a current that circled the globe along the Equator dispersing life somewhat uniformly. The continents move around because they sit atop the massive tectonic plates of solid rock that continually float over the Earth’s plastic-like lower mantle – at about the pace of a fingernail’s growth. Currently, in this slow-speed marathon, North America shifts westward a little less than an inch each year. By the beginning of the Triassic Period, some 248 million years ago, the landmasses were jammed into a single supercontinent named Pangaea (well, that’s what we call it now, there wasn’t anybody there to call it that then). Most of the planet was covered by the Great Ocean — “Panthalassa” (same naming situation) although a basin called the Tethys Sea (ditto) was located in Pangaea’s southeastern region (Tethys was the name of a Greek sea goddess). Starting in the Jurassic Period, some 200 to 140 million years ago, continental drift led the pieces of Pangaea to begin to separate again (actually, since drift is continual, a new supercontinent is likely to be formed in about 250 million years). As the Americas each moved west, independently, the Atlantic Ocean began to form, creating a narrower, shallower basin than the Pacific. Many species of soft corals, like this one from the Philippines,are are found in the Indo/Pacific basin but rare in the Atlantic/Caribbean basin. While cooler seas prevailed in the northern and southern latitudes, wind patterns began pushing the waters along the Equator in a trade-winds-driven east-to-west current – the Tethys Seaway – that passed through gateways in the Middle East and Central America and circumnavigated the globe, carrying with it the eggs, larvae and other stuff that make up the planktonic soup. The vast Pacific basin between the Americas and Asia was the major obstacle to its survival. The younger, narrower Atlantic was easily overcome. As a result, marine life populations among the landmasses were considerably less differentiated than is the case now. But just as continental drift allowed the Tethys current’s creation, it ended it. The separate African and Eurasian landmasses became connected in the Middle East through the Miocene Epoch, 24 to 5 million years ago. The one-time seaway passage became the enclosed Mediterranean Sea and the worldwide circulation of warm water was shut down. To the west, the North and South American continents remained separated – until tectonics began lifting the Isthmus of Panama some 5.3 million years ago. 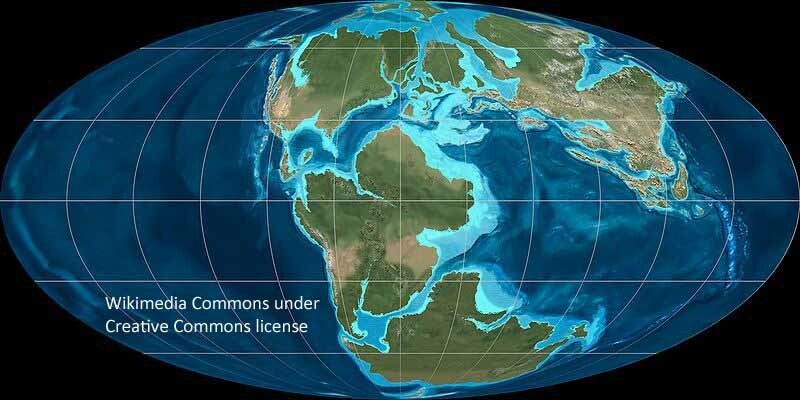 By 1.8 million years ago, near the end of the Pliocene Epoch, the Atlantic/Caribbean and Pacific were separate oceans. Population divergence reflecting regional isolation is inevitable, but the two oceans’ separate life paths were helped along dramatically by a key phase in the Earth’s pattern of warming and cooling. Not only have the continents continually been reconfigured over the ages, the Earth has cycled through at least 17 ice ages during the last 2 million years. Whenever the planet cools, locking up moisture in land-based ice sheets, sea levels drop (and, of course, rise during warm periods; The topographical sizes and shapes of dry landmasses have shifted significantly through all of these cycles). Our comfortable present age is actually a relatively warm interglacial period that started about 12,000 years ago. The rising or falling of sea levels profoundly affect marine life. Most take place over geological time, slowly enough that marine populations can shift with them. 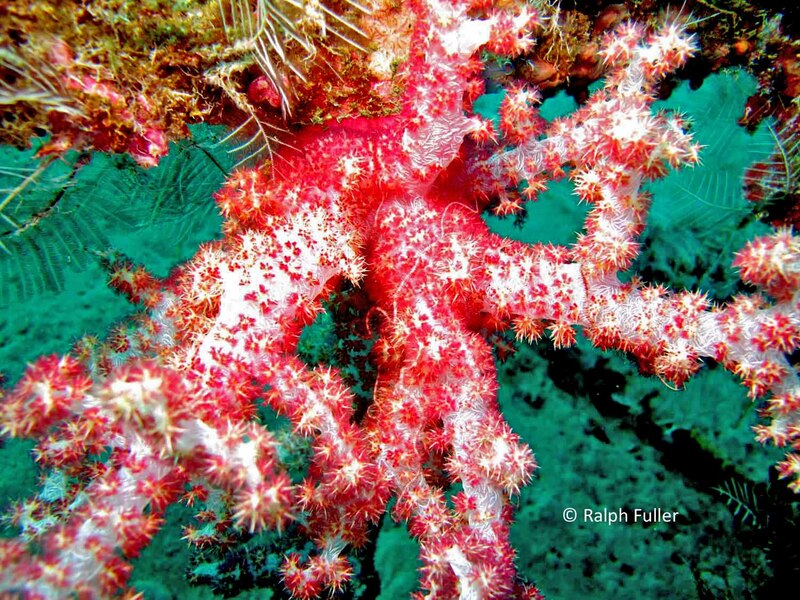 If the process is significantly stretched out, corals can reproduce in new, suitable habitats – if they can find them. When sea levels sink very low, the availability of hard bottom surfaces suitable for settlement becomes problematic. The great ice age we know best for covering North America and Europe with two-mile-thick glaciers as late as 18,000 years ago caused sea levels worldwide to drop, by some estimates, some 425 feet below those of today. As marine habitats dried up, the loss of ocean life was extensive – not just in population counts but in survival of entire species. The Atlantic basin, a half-mile shallower on average than the Indo-Pacific, was hit especially hard. 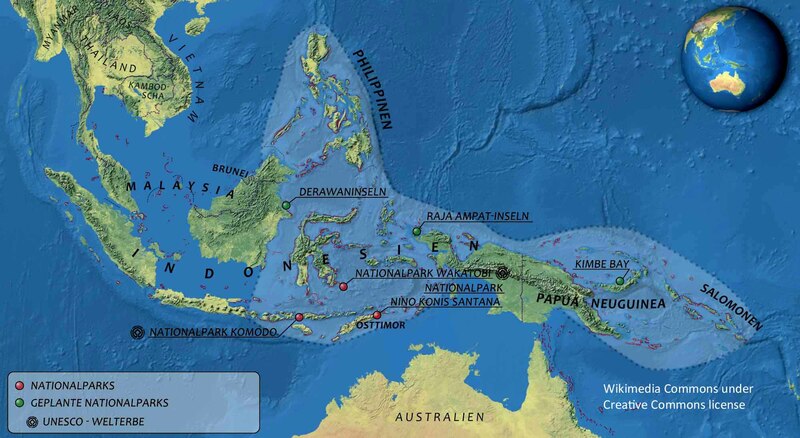 This triangle-shaped region of the Pacific Ocean, encompassing the Philippines and Indonesia, represents the highest diversity of tropical marine life on the planet. The consequences hold true even today. Numbers of species of fishes, corals and other creatures found in the Atlantic/Caribbean are far lower than in the Indo-Pacific. In fact, a pattern of survival in isolated, deep basins throughout the Indo-Pacific likely promoted the extensive independent evolution of new species throughout the greater ocean. Life fared best in the western Pacific. A triangle embracing the Philippines and central and eastern Indonesia remains the centerpiece of species diversity, estimated to hold more than 700 species of stony corals and 4,000 species of reef fishes. This compares with only 60 or so stony coral species and 1,400 fish species in the Caribbean and Western Atlantic. The same pattern holds true with other groups of animals: In the Indo-Pacific, 2,000 species of bivalves and 1,200 species of sea stars and their relatives; in the Atlantic/Caribbean, 378 bivalve species and 148 sea stars. The differences reflect more than simple population volumes. The Indo-Pacific, for example, survived with abundant diversities of animals like soft corals (rare in the western Atlantic/Caribbean, and usually existing, when they do, well below safe diving limits). On the other hand, gorgonians like sea fans and sea plumes are considerably more abundant in the Caribbean than in the Indo-Pacific. Even within regions, diversity drops with distance. Although overall speciation is higher throughout the Indo-Pacific than in the western Atlantic/Caribbean, it’s lower on Australia’s Great Barrier Reef and in the western Indian Ocean than in the Philippine/Indonesia triangle. Similarly, in the Atlantic basin, speciation is lower in the Bahamas than in the Caribbean. Thus, hard-to-discern factors like moving continents and distant ice ages play large roles in the patterns of life we see in the oceans today. Principal Sources: The Life and Death of Coral Reefs, Charles Birkeland, et.al. ; Marine Biology, Peter Castro and Michael Huber; The World Atlas of Coral Reefs, Mark Spaulding, Corinna Ravilious and Edmund Green; The Oceans, Ellen Prager.